This book explores how and why civic spaces are used by different communities in Asia and what role urban governance and public participation play in the support or demise of communities. Using case studies of contemporary city life throughout, the contributors provide insights into the importance and value of civic space, arguing that civic spaces provide not only the physical sites for civil society to function autonomously; but also provide a sense of place in the form of identity, meaning, memory, history and linkages with the wider world. 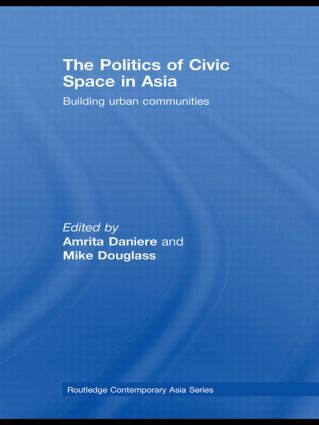 Each chapter focuses on the production of and access to civic spaces in a particular Asian city, as well as examples of successes and failures that can inform urban policy regarding inclusive, tolerant and socially vibrant city life through focused attention on the provision and continuity of civic space. This book is designed to provide information to policymakers, researchers and students of the developing world regarding the importance and value of civic space in terms of creating and supporting urban communities. As such, The Politics of Civic Space in Asia will be an invaluable resource for those interested in urban planning, urban design, public policy and political science, as well as Asian studies more generally.